Recent decades have seen photography’s privileged relationship to the real come under question. Spurred by the postmodern critique of photography in the 1980s and the rise of digital technologies soon thereafter, scholars have been asking who and what built this understanding of the medium in the first place. Photography and Doubt reflects on this interest in photography’s referential power by discussing it in rigorously historical terms. How was the understanding of photographic realism cultivated in the first place? What do cases of staged and manipulated photography reveal about that realism’s hold on audiences across the medium’s history? Have doubts about photography’s testimonial power stimulated as much knowledge as its realism? 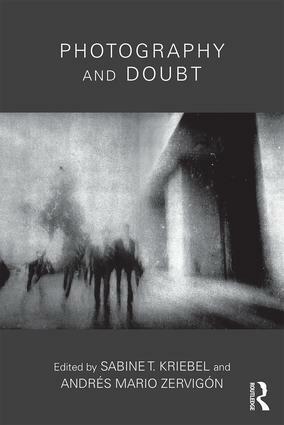 Edited by Sabine T. Kriebel and Andrés Mario Zervigón, Photography and Doubt is the first multi-authored collection specifically designed to explore these questions. Its 13 original essays, illustrated with 73 color images, explore cases when the link between the photographic image and its referent was placed under stress, and whenphotography was as attuned to its myth-making capabilities as to its claims to authenticity. Photography and Doubt will serve as a valuable resource for students and scholars in art history, visual and media studies, philosophy, and the history of science and technology. Sabine T. Kriebel teaches at the University College Cork, Republic of Ireland, where she has taught modern art and photography since 2004. Kriebel is author of Revolutionary Beauty: The Radical Photomontages of John Heartfield (2014) and has published widely on photography and photography theory, photomontage, and mass-circulation magazines. Andrés Mario Zervigón is Associate Professor in the Art History Department at Rutgers, The State University of New Jersey. He is author of John Heartfield and the Agitated Image: Photography, Persuasion, and the Rise of Avant-Garde Photomontage (2012) and coeditor of Photography and Its Origins (with Sheehan, 2015).